Playing with friends and family is a fun activity, especially when carried out outside the home. In addition to the family can enjoy together, we can also enjoy the fresh air outside the home. Events like this match if done on a holiday to eliminate fatigue in our busyness. Look for games that match and also entertaining. For that, we recommend a chess game that carried out outside the room. 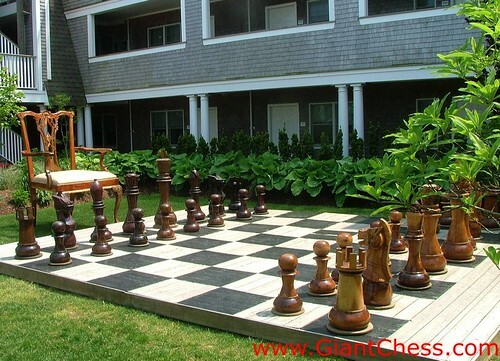 By using large pieces which are also equipped with boards, then you are able to enjoy an outdoor game of chess. In addition to looking for strategies to win, you will not get bored with the atmosphere around and feel the fresh air outside. Play in the park, Backyard, beaches, camping areas and other places of interest, then you'll find out how much fun playing chess using chess pieces large size. We provide great chess made of teak wood with the best quality. Our products are carved by craftsmen who are experienced and very durable use in all seasons.